Clowns Teach People Not To Be Afraid Of ... Clowns Coulrophobia, or fear of clowns, is the third most common phobia in Britain. To help combat that fear, John Lawson's Circus in the U.K. is offering "clown-seling," a pre-show therapy session to help people overcome their fear. Michele Norris talks with Paul Carpenter, aka Popol, a clown who helps with the sessions. Coulrophobia, or fear of clowns, is the third most common phobia in Britain. To help combat that fear, John Lawson's Circus in the U.K. is offering "clown-seling," a pre-show therapy session to help people overcome their fear. Michele Norris talks with Paul Carpenter, aka Popol, a clown who helps with the sessions. Our next story involves coulrophobia, and don't feel bad if you don't know what that is because we didn't either until we spotted a news story today about free workshops to help people get over that specific fear. Coulrophobia is the fear of clowns. And a circus, now touring in Britain, is offering help to people who are shaken to the core by the idea of big red noses and oversized rubber shoes. For more, we turn to Paul Carpenter, one of the so-called clownselors in John Lawson's Circus. In clown suit, he's known as Popol, but for now, we'll call him Mr. Carpenter. 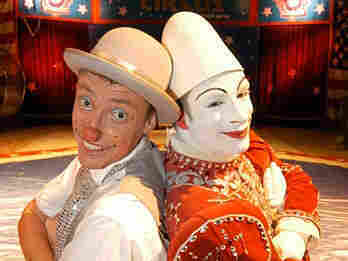 Mr. PAUL CARPENTER (Clown, John Lawson's Circus): It's nice to speak to you. NORRIS: Now, do I understand this right? Coulrophobia is the third most common phobia in all of Britain? Mr. CARPENTER: Yes, there was a national poll in the newspaper recently of the nation's biggest fears, and coulrophobia, the fear of clowns, was number three after spiders and needles. NORRIS: And above fear of flying, I understand. Mr. CARPENTER: It is. People are more scared of clowns than flying in a plane. Isn't that amazing? NORRIS: It certainly is interesting. How does this phobia manifest itself? Is it a bit like claustrophobia, where people break out in a sweat and can't seem to function? Mr. CARPENTER: Well, it's amazing. Sometimes, we're in the circus and the audience are coming in, and I'm there in the front of the circus with another clown greeting people. And then someone will say, oh, no, no. Keep them away from me. Keep them away from me. And they'll get nervous. They'll start shaking. They're genuinely scared. So we thought, right, we're going to overcome this and show people that they're - to get them into the big top, not to let their fears stop them coming and having a good time. NORRIS: So how do you do that? How do you help people get over that fear? Mr. CARPENTER: Well, if anyone wants to come for some clown therapy -we're also calling it clownseling - we invite them to the big top during the day when it's quiet and they meet me and our other clown, but they meet us in our normal, everyday guises, not in makeup or anything. And then we take them into the circus ring, and they watch us as we slowly transform ourselves into our clown personalities. We put on our makeup very slowly, and then we put on our costumes. And if that goes well and they haven't run for the door, we then try and get them interacting with us in the circus ring. We go through a few clown routines, getting them involved. And if that goes well, our ultimate aim is to get the person themselves dressed up in costume and makeup, and then we help them find their own inner clown. Mr. CARPENTER: So they come into the circus being scared, and then they end up leaving as a clown themselves. NORRIS: Now, I kept hearing you say if that goes well, would suggest that sometimes it doesn't. Mr. CARPENTER: Well, we've had varying degrees of success. But, you know, it's something we're - we've only been doing it for a few weeks, and we're still refining our process and working on it, but we have had some great results. NORRIS: I'm wondering if this is the beginning of a trend. Will other circuses follow suit? Mr. CARPENTER: Well, but there's been a lot of interest in it over here in the U.K., so it could well be that it will catch on with other clowns. I hope it does, because we're doing everything we can to keep clowning alive. NORRIS: Mr. Carpenter, thank you very much for your time. It's been great to talk to you. Mr. CARPENTER: It's been a pleasure. Thank you very much. NORRIS: That was Paul Carpenter. He's one of the so-called clownselors in John Lawson's Circus, that's part of a program that they run to help people get over the fear of clowns - a fear that's called coulrophobia.